The roots or rhizomes of the perennial ginger plant which are harvested when their reed-like foliage dies back. In cooking, ginger root adds a sweet, pungent hot flavor to food and is often added to meat, sauces, soups, baked goods, beverages and liqueurs. It can also be eaten on its own or made into a spicy tea. 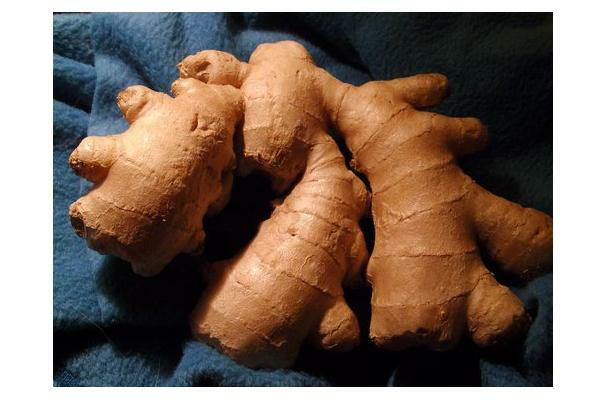 Apart from its versatility in cooking, ginger root also provides many medicinal benefits and has been found to aid in digestion, stimulate the appetite and help with nausea. The volatile oils from the ginger root have also been used in perfumes. Tree branch like physical appearance. Light brown in color and very thick. Colors: Light brown. Inside flesh can be red, yellow, or brown. Flavors: Mild spicy flavor. Zesty and potent. Choosing: Choose root that is smooth, firm, and has no signs of mold. Buying: Ginger root is available at all grocers. It can be bought fresh, pickled or ground in jars. To make tea just cut a few thin slices and steep them in a cup of boiling water for 5 minutes. Use a cheese grater to use for a spice in many different food items. Wrap it in a towel and place in a plastic bag. Put it in the fridge or freezer depending on your furture plans for using the ginger root.